Humidity is the amount of water vapour present in air. Water vapour, the gaseous state of water, is generally invisible to the human eye. Humidity indicates the likelihood for precipitation, dew, or fog to be present. The amount of water vapour needed to achieve saturation increases as the temperature increases. As the temperature of a parcel of air decreases it will eventually reach the saturation point without adding or losing water mass. The amount of water vapour contained within a parcel of air can vary significantly. For example, a parcel of air near saturation may contain 28 grams of water per cubic metre of air at 30 °C, but only 8 grams of water per cubic metre of air at 8 °C. Three primary measurements of humidity are widely employed: absolute, relative and specific. Absolute humidity describes the water content of air and is expressed in either grams per cubic metre or grams per kilogram. Relative humidity, expressed as a percentage, indicates a present state of absolute humidity relative to a maximum humidity given the same temperature. Specific humidity is the ratio of water vapor mass to total moist air parcel mass. Humidity plays an important role for surface life. For animal life dependent on perspiration (sweating) to regulate internal body temperature, high humidity impairs heat exchange efficiency by reducing the rate of moisture evaporation from skin surfaces. This effect can be calculated using a heat index table, also known as a humidex. Absolute humidity is the total mass of water vapor present in a given volume or mass of air. It does not take temperature into consideration. Absolute humidity in the atmosphere ranges from near zero to roughly 30 grams per cubic metre when the air is saturated at 30 °C (86 °F). The absolute humidity changes as air temperature or pressure changes, if the volume is not fixed. This makes it unsuitable for chemical engineering calculations, e.g. in drying, where temperature can vary considerably. As a result, absolute humidity in chemical engineering may refer to mass of water vapor per unit mass of dry air, also known as the humidity ratio or mass mixing ratio (see "specific humidity" below), which is better suited for heat and mass balance calculations. Mass of water per unit volume as in the equation above is also defined as volumetric humidity. Because of the potential confusion, British Standard BS 1339  suggests avoiding the term "absolute humidity". Units should always be carefully checked. Many humidity charts are given in g/kg or kg/kg, but any mass units may be used. Relative humidity is an important metric used in weather forecasts and reports, as it is an indicator of the likelihood of precipitation, dew, or fog. In hot summer weather, a rise in relative humidity increases the apparent temperature to humans (and other animals) by hindering the evaporation of perspiration from the skin. For example, according to the Heat Index, a relative humidity of 75% at air temperature of 80.0 °F (26.7 °C) would feel like 83.6 °F ±1.3 °F (28.7 °C ±0.7 °C). Specific humidity (or moisture content) is the ratio of the mass of water vapor to the total mass of the moist air parcel. Specific humidity is approximately equal to the mixing ratio, which is defined as the ratio of the mass of water vapor in an air parcel to the mass of dry air for the same parcel. As temperature decreases, the amount of water vapor needed to reach saturation also decreases. As the temperature of a parcel of air becomes lower it will eventually reach the point of saturation without adding or losing water mass. A device used to measure humidity is called a psychrometer or hygrometer. A humidistat is a humidity-triggered switch, often used to control a dehumidifier. There are various devices used to measure and regulate humidity. Calibration standards for the most accurate measurement include the gravimetric hygrometer, chilled mirror hygrometer, and electrolytic hygrometer. The gravimetric method, while the most accurate, is very cumbersome. For fast and very accurate measurement the chilled mirror method is effective. For process on-line measurements, the most commonly used sensors nowadays are based on capacitance measurements to measure relative humidity, frequently with internal conversions to display absolute humidity as well. These are cheap, simple, generally accurate and relatively robust. All humidity sensors face problems in measuring dust-laden gas, such as exhaust streams from dryers. Humidity is also measured on a global scale using remotely placed satellites. These satellites are able to detect the concentration of water in the troposphere at altitudes between 4 and 12 kilometres. Satellites that can measure water vapor have sensors that are sensitive to infrared radiation. Water vapor specifically absorbs and re-radiates radiation in this spectral band. Satellite water vapor imagery plays an important role in monitoring climate conditions (like the formation of thunderstorms) and in the development of weather forecasts. While humidity itself is a climate variable, it also overpowers other climate variables. The humidity is affected by winds and by rainfall. The most humid cities on earth are generally located closer to the equator, near coastal regions. Cities in South and Southeast Asia are among the most humid. Kuala Lumpur, Manila, Jakarta, and Singapore have very high humidity all year round because of their proximity to water bodies and the equator and often overcast weather. Some places experience extreme humidity during their rainy seasons combined with warmth giving the feel of a lukewarm sauna, such as Kolkata, Chennai and Cochin in India, and Lahore in Pakistan. Sukkur city located on the Indus River in Pakistan has some of the highest and most uncomfortable dew points in the country, frequently exceeding 30 °C (86 °F) in the Monsoon season. High temperatures combine with the high dew point to create heat index in excess of 65 °C (149 °F). Darwin, Australia experiences an extremely humid wet season from December to April. Shanghai and Hong Kong also have an extreme humid period in their summer months. During the South-west and North-east Monsoon seasons (respectively, late May to September and November to March), expect heavy rains and a relatively high humidity post-rainfall. Outside the monsoon seasons, humidity is high (in comparison to countries further from the Equator), but completely sunny days abound. 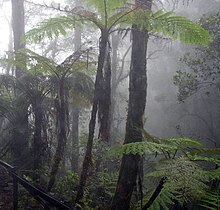 In cooler places such as Northern Tasmania, Australia, high humidity is experienced all year due to the ocean between mainland Australia and Tasmania. In the summer the hot dry air is absorbed by this ocean and the temperature rarely climbs above 35 °C (95 °F). In the United States the most humid cities, strictly in terms of relative humidity, are Forks and Olympia, Washington. Because high dew points play a more significant role than relative humidity in discomfort, the air in these western cities usually does not feel "humid". In general, dew points are much lower in the Western U.S. than those in the Eastern U.S. The highest dew points consistently found in the US are found in coastal Florida and Texas. When comparing Key West and Houston, two of the most humid cities from those states, coastal Florida seems to have the higher dew points on average. However, Houston lacks the coastal breeze present in Key West, and, as a much larger city, it suffers from the urban heat island effect. For reasons speculated to include evapotranspiration from crops with broad leaves (e.g. maize) and, on some occasions, bright sunshine beating down on saturated soil, the upper Mississippi River valley can on occasion have extreme dew points, and in fact the record for the Western Hemisphere has been set in the region and has remained somewhere in the region for many years. A dew point of 88 °F (31 °C) was recorded in Moorhead Minnesota on July 19, 2011, with a heat index of 133.5, although dew points over 80 °F (27 °C) are rare there. Appleton, Wisconsin registered a dew point of 90 degrees F on 13 July 1995 at 17.00 local time (UTC -5.00) with an air temperature of 104 °F (40 °C) resulting in a heat index of 149.8 °F (65 °C) degrees; the dew point record and ostensibly the simultaneous possible heat index (for western hemisphere), specific humidity and absolute humidity world records have apparently held and in fact the highest dew point measured in the country bounced amongst or was tied by locations in Wisconsin, Minnesota, and Iowa during the preceding 90 years or more with locations in northern Illinois also coming close. The record was set during the 1995 Midwest heat wave disaster which was characterised by a very strong temperature inversion which caused cloudless skies during this in spite of an apparent world record surface-based CAPE set at the same time. Dew points of 95 °F (35 °C) are found on the Red Sea coast of Saudi Arabia at certain times. One 2003 report of a temperature of 95 °F (35 °C) with the same dewpoint and therefore 100% relative humidity and zero visibility in fog, along with the highest directly measured heat index of 81 °C (178 °F) was received from Dhahran, Saudi Arabia; higher heat indices may or may not have resulted from higher temperatures with dew points in the 80s degrees F in Iran and Saudi Arabia and have been interpolated from satellite readings of surface temperature in the Lut and Gobi deserts in excess of 70 °C (158 °F) whereas heat indices dip below the actual air temperature in extremely dry air. Given the extreme lack of moisture reaching the area, as well as low temperatures, the lowest dewpoints as well as absolute and specific humidity, as well as instances of virtually 0% relative humidity or at least too small a fraction of a percent to calculate are found in Antarctica in places such as the South Pole and the Russian Vostok scientific station. The US city with the lowest annual humidity is Las Vegas, Nevada, averaging 39% for a high and 21% as a low. The lowest recorded, and a record for North America, was set in April 2016 and given as 1 per cent and was in fact a fraction of that in a case of a temperature of 106 °F (41 °C) with a dew point of −24 °F (−31 °C). Humidity affects the energy budget and thereby influences temperatures in two major ways. First, water vapor in the atmosphere contains "latent" energy. During transpiration or evaporation, this latent heat is removed from surface liquid, cooling the earth's surface. This is the biggest non-radiative cooling effect at the surface. It compensates for roughly 70% of the average net radiative warming at the surface. Second, water vapor is the most abundant of all greenhouse gases. Water vapor, like a green lens that allows green light to pass through it but absorbs red light, is a "selective absorber". Along with other greenhouse gases, water vapor is transparent to most solar energy, as one can literally see. But it absorbs the infrared energy emitted (radiated) upward by the earth's surface, which is the reason that humid areas experience very little nocturnal cooling but dry desert regions cool considerably at night. This selective absorption causes the greenhouse effect. It raises the surface temperature substantially above its theoretical radiative equilibrium temperature with the sun, and water vapor is the cause of more of this warming than any other greenhouse gas. The human body dissipates heat through perspiration and its evaporation. Heat convection, to the surrounding air, and thermal radiation are the primary modes of heat transport from the body. Under conditions of high humidity, the rate of evaporation of sweat from the skin decreases. Also, if the atmosphere is as warm as or warmer than the skin during times of high humidity, blood brought to the body surface cannot dissipate heat by conduction to the air. With so much blood going to the external surface of the body, less goes to the active muscles, the brain, and other internal organs. Physical strength declines, and fatigue occurs sooner than it would otherwise. Alertness and mental capacity also may be affected, resulting in heat stroke or hyperthermia. Air conditioning reduces discomfort by reducing not just temperature but humidity as well. Heating cold outdoor air can decrease relative humidity levels indoors to below 30%, leading to ailments such as dry skin, cracked lips, dry eyes and excessive thirst. Higher humidity reduces the infectivity of aerosolized influenza virus. Electronic devices are often rated to operate only under specific humidity conditions (e.g., 5% to 95%). At the top end of the range, moisture may increase the conductivity of permeable insulators leading to malfunction. Too low humidity may make materials brittle. A particular danger to electronic items, regardless of the stated operating humidity range, is condensation. When an electronic item is moved from a cold place (e.g. garage, car, shed, an air conditioned space in the tropics) to a warm humid place (house, outside tropics), condensation may coat circuit boards and other insulators, leading to short circuit inside the equipment. Such short circuits may cause substantial permanent damage if the equipment is powered on before the condensation has evaporated. A similar condensation effect can often be observed when a person wearing glasses comes in from the cold (i.e. the glasses become foggy). It is advisable to allow electronic equipment to acclimatise for several hours, after being brought in from the cold, before powering on. Some electronic devices can detect such a change and indicate, when plugged in and usually with a small droplet symbol, that they cannot be used until the risk from condensation has passed. In situations where time is critical, increasing air flow through the device's internals, such as removing the side panel from a PC case and directing a fan to blow into the case, will reduce significantly the time needed to acclimatise to the new environment. Common construction methods often produce building enclosures with a poor thermal boundary, requiring an insulation and air barrier system designed to retain indoor environmental conditions while resisting external environmental conditions. The energy-efficient, heavily sealed architecture introduced in the 20th century also sealed off the movement of moisture, and this has resulted in a secondary problem of condensation forming in and around walls, which encourages the development of mold and mildew. Additionally, buildings with foundations not properly sealed will allow water to flow through the walls due to capillary action of pores found in masonry products. Solutions for energy-efficient buildings that avoid condensation are a current topic of architecture. High humidity can often have a negative effect on the capacity of chemical plants and refineries that use furnaces as part of a certain processes (e.g., steam reforming, wet sulfuric acid processes). For example, because humidity reduces ambient oxygen concentrations (dry air is typically 20.9% oxygen, but at 100% relative humidity the air is 20.4% oxygen), flue gas fans must intake air at a higher rate than would otherwise be required to maintain the same firing rate . High humidity in the oven, represented by an elevated wet-bulb temperature, increases the thermal conductivity of the air around the baked item, leading to a quicker baking process or even burning. Conversely, low humidity slows the baking process down. ^ "What is Water Vapor". Retrieved 2012-08-28. ^ "Antarctic Air Visits Paranal". ESO Picture of the Week. Retrieved 4 February 2014. ^ "Climate - Humidity indexes". Encyclopaedia Britannica. Retrieved 15 February 2018. ^ "Climate/humidity table". Transport Information Service of the German Insurance Association. Retrieved 15 February 2018. ^ "Water Vapor Myths: A Brief Tutorial". ^ Lide, David (2005). CRC Handbook of Chemistry and Physics (85 ed.). CRC Press. pp. 15–25. ISBN 0-8493-0485-7. ^ Steadman, R. G. (July 1979). "The Assessment of Sultriness. Part I: A Temperature-Humidity Index Based on Human Physiology and Clothing Science". Journal of Applied Meteorology. 18 (7): 861–873. Bibcode:1979JApMe..18..861S. doi:10.1175/1520-0450(1979)018<0861:TAOSPI>2.0.CO;2. ^ Seidel, Dian. "What is atmospheric humidity and how is it measured?". National Oceanic and Atmospheric Administration. National Oceanic and Atmospheric Administration. Retrieved 3 March 2017. ^ "Weather History for Sukkur, Pakistan – Weather Underground". ^ "USATODAY.com – Answers: Is Florida or Texas more humid". ^ ""Heat Storm" (record-setting dew point of 82 at MSP, heat index tied all-time record at 119!)". ^ "Relative Humidity - CityRating.com". ^ "Radiative Balance, Earth's Temperature, and Greenhouse Gases (lecture notes)". ^ Alley, R. (2014). "GEOSC 10 Optional Enrichment Article 1". ^ Businger, S. "Lecture 28: Future Global Warming Modeling Climate Change" (PDF). Archived from the original (PDF) on 2015-01-30. ^ Schwieterman, E. "Comparing the Greenhouse Effect on Earth, Mars, Venus, and Titan: Present Day and through Time" (PDF). ^ Isaac Newton (1704). Opticks. Dover. ISBN 978-0-486-60205-9. ^ "Heat and humidity - the lung association". www.lung.ca. Retrieved 14 March 2018. ^ "Optimum Humidity Levels for Home". AirBetter.org. 3 August 2014. ^ "Everything You Need to Know About Combustion Chemistry & Analysis – Industrial Controls".